A friendly and welcoming environment that fosters and encourages athletes of all ages, abilities and disciplines.Whether for fun, self-improvement or to compete at a national or international level, the City of Salisbury ARC offers a blend of coaching, mentoring, events and activities to suit all athletes whatever their personal goal. 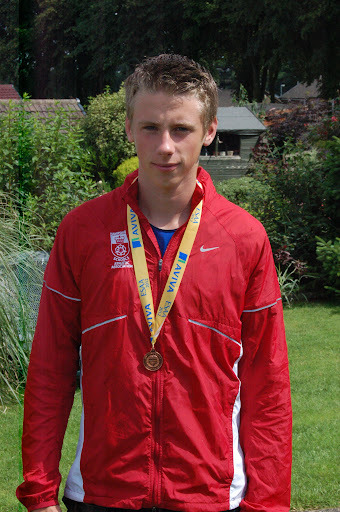 Jake Ness of City of Salisbury Athletic and Running Club sprinted to a well-earned national championship bronze medal on the famed track at Gateshead over the weekend. Competing against the country’s very best in his age group and running in a county squad, Ness tore round the track in the 4 x 100metre relay to take a superb third place in a very fast 43.01sec. The 15 year-old’s progress has underpinned the club’s growing success in the event, the age group team remaining unbeaten for the past two seasons and repeatedly breaking the club record in the process. In the heats of the 800m at Gateshead, Alex Mundell did well to produce a season’s best of 2min 16.8sec but due to the classy competition she failed to make it through to the final. Danielle Scott was up against tough opposition in the pole vault and her leap of 2.8m placed her 16th overall. In the 300m hurdles, Lizzie Clifford cruised through the qualifying rounds in pouring rain, but despite finishing strongly in the final was unluckily just outside the medals in fourth place. Just how high the standards are in these championships was illustrated in the 400m, where as one of the youngest in his under-17 age group Jake Ness took another big slice off his personal best in the heats, recording 50.2sec. But even that was not fast enough to qualify for the final, won in a blistering 48.53sec. Although our sport is primarily individual and our performance at events is individual – our success is as a team. None of us could achieve success if we trained and attended events alone. Sprint team has considerably grown in size. We have provided more representation to Club events such as Super 8 and Southern Athletics League than anyone else. 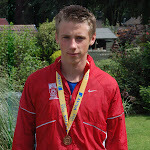 We have also had representatives at English Schools, National Indoor Championships and the National Outdoor Championships including a total of 4 championship medals.